Last weekend I managed an early morning trip to Martin Down in Hampshire. In many ways it felt like the last day of summer. Certainly many of the butterflies, particularly the Dark Green Fritillaries and many of the Skippers were well past their best, distinctly tatty. But I usually find something interesting to gawp at and this time it was this wee beastie, the Giant Tachinid Fly Tachina grossa. Now this is a large fly, a real whopper. 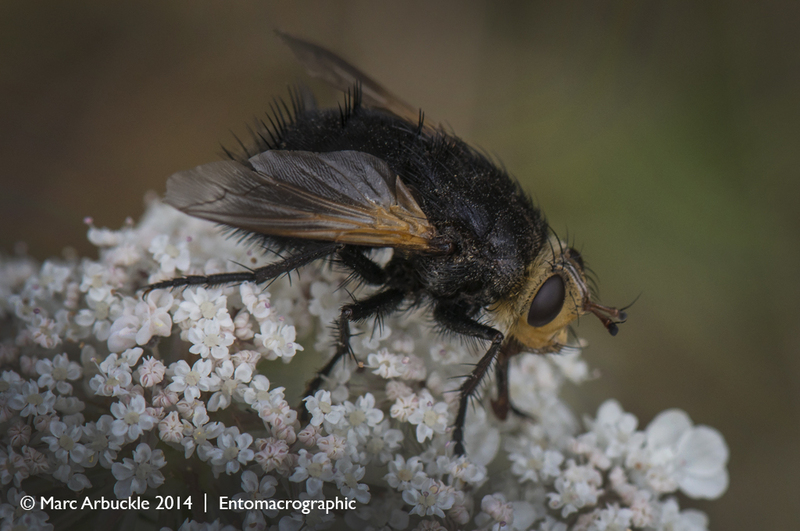 In fact at 15-19mm it’s the biggest tachinid in Europe. As you can see it’s quite distinctive. It’s big, it’s hairy, it’s black and it’s got a big yellow face so it’s not something you’ll easily confuse with anything else as it is the size of a bumblebee. It’s a parasitic fly that lays its eggs on large hairy caterpillars like those of the Fox and Oak Eggar moths. The larvae develop inside the living caterpillar slowly devouring it from the inside out. How grossa is that?